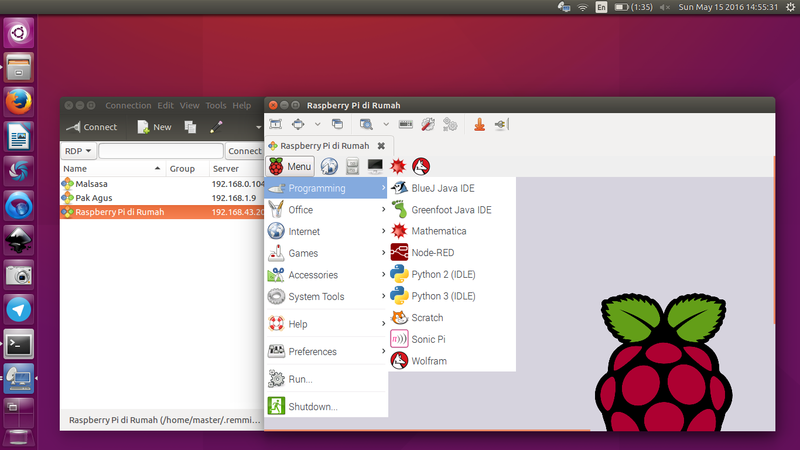 This tutorial is about establishing remote desktop connection from laptop to Raspberry Pi. This tutorial mainly dedicated for those don't have HDMI monitor for Raspberry Pi. 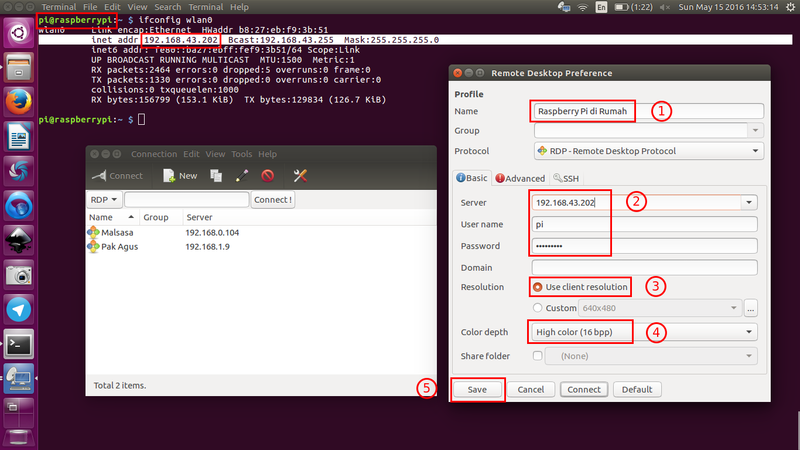 You will use your laptop monitor as Raspberry Pi monitor by using remote desktop (xrdp & remmina). This tutorial makes use of Raspberry Pi 3. Thanks to Juang Nakarani for lending me a HDMI monitor and kindly teaching me remote desktop. A Raspberry Pi 3 with Raspbian operating system. A WLAN router, an Android phone for example. Internet access from WLAN router. A laptop with Ubuntu operating system. Write Raspbian image into a microsd card. Read How To Write Raspbian. Create a USB tether WLAN hotspot from your Android phone. We name its SSID as ubuntero and WPA-PSK and its password as netrunner. Access your already bootable microSD from your laptop. Access it until you can read /etc/network/interfaces file inside the microSD. That is the configuration file for Raspbian. Don't edit the /etc/network/interfaces from your own Ubuntu system. Edit the interfaces file by doing command sudo nano /the/path/to/interfaces. Enter the correct settings like the example below. Essentially, you need to provide SSID name and password from your Android hotspot. Note: you should change the ubuntero into your own hotspot SSID, and change the netrunner into your hotspot password. Basically you just need to add 4 lines (from auto wlan0 until netrunner) and it is safe to delete from the original the 7 lines (from iface eth0 until wpa-supplicant.conf). What those settings do in Raspberry Pi is to automatically detect and connect into your Android WLAN tethering hotspot. Because the Raspberry connects to the hotspot and your laptop connects to the same hostpot, you can login from your laptop into the Raspberry Pi. We need it because we have no monitor for Raspberry Pi. Now connect power into your Raspberry Pi until it boots. You will see the two indicator leds blinking. Wait for about 1 or 2 minutes until Raspberry Pi can connect automatically into your Android hotspot. That nmap command scans your network (Android hotspot) for any other host connected from number 202 until number 210. See picture below, nmap finds a host named raspberrypi with IP address 192.168.43.202. This is my Raspberry Pi. And with the same method you will find your Raspberry Pi too. Now from your laptop, you should control your Raspberry Pi in case of installing xrdp. From your laptop, login to Raspberry Pi with ssh (openssh, already installed built-in in Ubuntu) command below. Note: default username for Raspbian is pi with password raspberry. Now you must see Raspbian shell prompt like this pi@raspberrypi: ~$ if you have logged in correctly into Raspberry. You will see a notice text saying you are using GNU/Linux. To exit, just type command exit. See picture below. Explanation: first command will reload your Raspbian to download the index files from the Raspbian repository. Second command will install xrdp and its dependencies for your Raspbian. Note that these two commands executed in Raspberry Pi not in your laptop. Open Remmina. Set some configuration like these. Type your connection name. You may type any name, e.g. your cat name is okay. In this example, I give it name Raspberry Pi di Rumah. 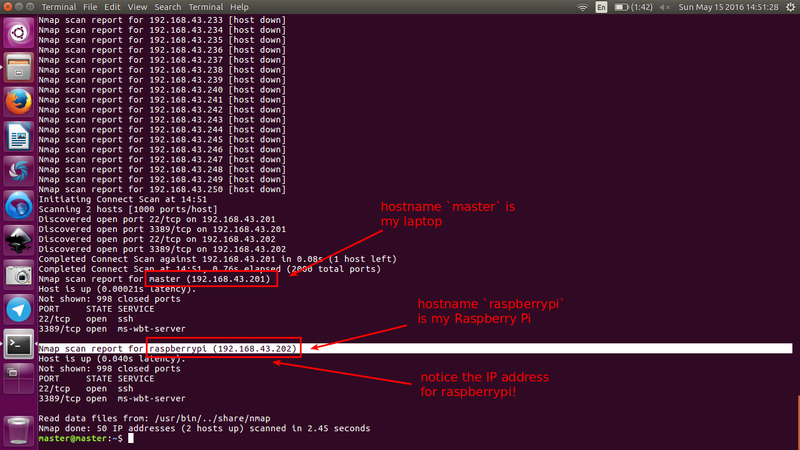 In Server: field, type IP address of your Raspberry Pi. In this example, 192.168.43.202. In User name: field, type pi. In Password: field, type raspberry. In Resolution: field, choose Use client resolution. In Color depth field, choose High color (16 bpp). Now select your connection entry in Remmina and press Connect button. If there is a simple window asking pi password, enter raspberry and OK. You will see Remmina shows your Raspbian desktop from Raspberry Pi. Now, your laptop monitor is your Raspberry Pi monitor. Congratulations!